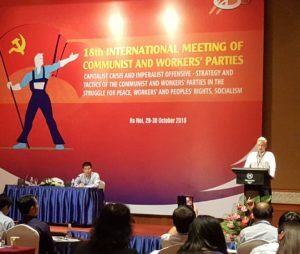 Ilya Zorkhin Nilsson, the international secretary of the Communist Party of Sweden, held the following speech at the International Meeting of Communist and Workers’ Parties (IMCWP) in Hanoi, Vietnam. First of all, on behalf of the Communist Party of Sweden, I would like to thank and congratulate the Communist Party of Vietnam for hosting this conference. At the same time we would like to express our full admiration for the heroic Communist Party and the great people of Vietnam for being the first to defeat US imperialism. Your grand victory is a victory for all workers worldwide. In our last contribution we exposed the commonly prevailing myth of Sweden being a progressive and peaceful country, by highlighting the role of Sweden in the military interventions in Afghanistan, Syria and Libya. We also mentioned the privatization craze that preceeded and continued with the EU accession. Of particular note is that Sweden may be the only remaining country in which primary and secondary education is open to state-funded for-profit schools run by venture capitalists, after the model was prohibited in Chile last year. Profits are, not surprisingly, generated by cutting costs by firing teachers and by increasing the workload of the remaining staff, introducing lectures without lecturers, removing school libraries, and other resources used in education. In secondary education more than 25% of all pupils are enrolled in such private school companies, and understandably pupils are left in very delicate situations when their schools go bankrupt after having been plundered by their owners, often losing years in the process, possibly affecting their future employment and tertiary education prospects for life. No wonder this development is accompanied with falling performance of students, putting the future of the country at stake. Moreover, should the TTIP, or a similar agreement, be passed, corporations may sue governments for making laws that hinder profits, and overturn them, including ones that prohibit this type of companies, further consolidating absurdity. Returning to the the issue of war and peace, there have unfortunately been major developments which have worsened the situation just this past year. It was already our impression that the Swedish Armed Forces were in collusion with the interests of US imperialism, through agreements, exchange and training programs. Now, however, this collaboration has been strengthened through the host nation agreement with NATO, that was ratified by social democratic and other bourgeois elements of the Swedish parliament, implying that foreign nuclear weapon carrying vessels can be stationed on Swedish territory. Furthermore, it allows for waging offensive warfare from Swedish soil, while at the same time promising immunity and guarantees to the security of foreign installations and logistics. Simultaneously, polls show, that the population, to a large extent, is unaware of what NATO is and what neutrality entails. This is likely due to the plummetting levels of education combined with monopolization of media. At the moment, 70% of the wealth of the Stockolm stock exchange is concentrated to 15 families. Three family conglomerates own practically all of the, so called, free press, resulting in the complete dominance of bourgeois perspectives, with any hints of real opposition being filtered out systematically. They are clever, they disguise their own propaganda under the pretexts of a defense against alleged Russian propaganda. An example of this would be the implied Russian submarine violations just prior to the defense budget discussions, which of course are impossible to disprove. Eventually the, so called, conclusive evidence, was found to be originating from Swedish vessels, but harm had already been done and the objectives fulfilled. Putting all pieces together, the host nation agreement, the massive anti-Russian propaganda campaign and statements by senior Swedish officers that the country could be involved in a war in a few years time, there can be few doubts as to the underlying reasons. It is likely a psychological preparation of the population to accept the possibility of a war on Russia. This year our party and progressive organizations joined forces to create local anti-NATO committees spanning the whole country, holding square meetings and public debates, distributing leaflets, culminating in the largest manifestation against NATO in our history, while still being too small and relatively modest in international terms. Moreover, we should not forget about the refugee question, which has grown increasingly important following the US imperialist interventions, through direct force and by proxy, in Libya and Syria of late. A growing number of victims of imperialism, who find themselves in desperate situations and who in many cases are left with few other viable options than leaving their homes, arrive in imperialist countries, where they are increasingly being used as an instrument of pressure, a bargaining chip, under the guise of slogans like ”entry jobs”, against workers’ rights. The refugee crisis is far from classless. It is therefore of essence to include and organize migrant workers in our common struggle and to extend and reserve our solidarity for people engaged in such a struggle. Furthermore, our party remains small, but since our last congress in 2013, we have founded three new local organizations. A completely new party district for middle Sweden has been constituted, and another is on its way in the south. It may seem like small steps on an international level, but considering our conditions as a small party in northern Europe, such gains are considerable. Another achievement is that we now have an affiliate organization of the World Federation of Trade Unions in our country, which hopefully means the beginning of the establishment of a class conscious opposition to the class collaborationist social democratic unions. An opposition which has not existed in our country for the last 50 years. A complicating matter is that the majority of potential comrades in Sweden belong to a number of other parties that primarily are active in other parts of the world, but that still maintain organizations in our country. The result of this is that many, with a few exceptions, being unfamiliar with the political landscape, have been isolated from the class struggle, and brought to support opportunist forces like the Left Party – a party that ratified the military intervention in Libya, and that stands by and watches in complete silence as Sweden slowly approaches NATO. A party that supported the coup in Ukraine by flying the petlurian colors in solidarity on its election booths. A party that, when the peace movement opposed sending troops to Afghanistan, voted in favour of the operation. It cannot be stressed enough that members and sympathizers of fraternal parties in exile need to make contact with local fraternal parties. They are part of the same working class and share the same experiences, but miss out on valuable knowledge that has been acrued locally, and in turn their knowledge becomes lost to us. It is time we agreed on bringing forward directives, asking members living abroad to contact local fraternal parties, and to activate themselves in them, rather than being fragmented by nationality. Lastly, next year is not only the centennial of our party. It is also the centennial of the Great October Revolution. Rights we take for granted today, were fought for and conquered through the hard struggle and sacrifices of working men and women. A struggle that must be celebrated and continued, no matter how hard the conditions at hand are, as now is a time when fundamental change is needed urgently, to guarantee peace and the dignity of man.